It’s not terrible. Director Ridley Scott didn’t make some kind of hugely annoying, incoherent movie or anything like that. There are a few pockets of enjoyment in what unfolds on screen and watching it is semi-pleasant. But after the credits roll, mulling over everything you just saw, the film continues to sour like milk left out in the sun. It was good for a little bit, but not for long, and that’s just not good enough for a franchise with this history. Alien: Covenant is a sequel to Scott’s 2012 film, Prometheus, and it follows yet another ship traveling into deep space. This time, though, the ship is out there not for research but to colonize a new planet. Things then go awry, they land on a different planet, and very quickly it becomes obvious that bad things are about to happen. And while the characters might realize they made a mistake relatively quickly, the film is not quick in getting to that point. Alien: Covenant is criminally backloaded, with almost an hour going by before the crew lands on the planet and another half-hour or so after that before the thrills start to really kick in. In that long slog of exposition, you spend a lot of time with the new characters but still manage not to learn much about them. Daniels (Katharine Waterston) is the main character so, of course, she has the best backstory. The other standout is Tennessee, a pilot played by Danny McBride, who thrives on the actor’s charisma. As for the rest of the crew (which includes Billy Crudup, Demian Bichir, Jussie Smollett, and Callie Hernandez), you basically learn they are on this flight to do a job and that’s all. Some of their interactions raise mildly engaging questions, but nothing particularly exciting or interesting happens in the film for a long, long time. That changes a little once the Covenant ship gets to this mysterious planet. The film opens up with a little more action, unsettling imagery, and it feels like things may be about to take a turn for the better. Unfortunately, that’s not the case. With one or two small exceptions, the characters don’t change very drastically when faced with these obstacles, the tone stays very even, and there are almost no scares to be had. There’s plenty of gore, yes, but nothing that scary. What you do get is is a lot of explanation of what happened after Prometheus. What happened to the characters, where the ship went, all of that. You even start to think you’re going to get answers to the big “Why are we here?” questions from Prometheus too, which were by far the best part of that film. However, before any real answers can be revealed, Alien: Covenant almost maliciously removes any chance of that happening. The film includes such a brutal, clean dismissal of Prometheus’ potential it almost feels like Scott is apologizing to fans for that film. Everything that follows pads the mythology about the title xenomorph, driven primarily by an oddly unmotivated and slightly confusing plot involving Michael Fassbender’s android character from the first film, David, and a second android on the Covenant, named Walter. Fassbender is great in both roles, but the character’s stories demystify everything that made those aliens so terrifying in the first place. So Alien: Covenant gets rid of everything good about Prometheus and takes all the mystery of Alien away. It basically makes both films worse. 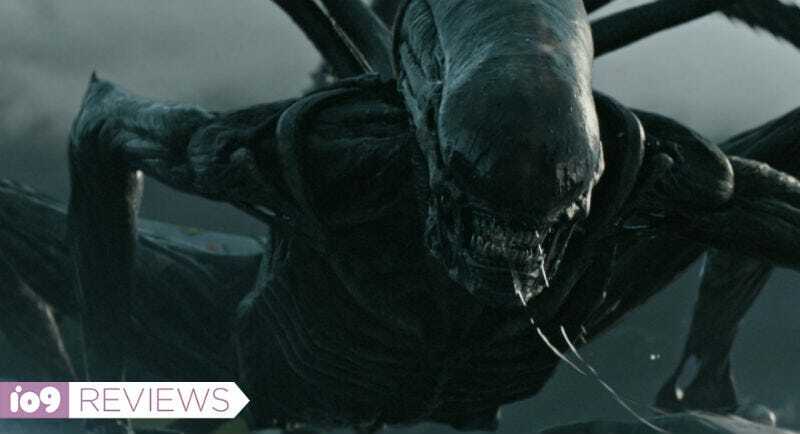 Which is what you should be able to expect from a Ridley Scott Alien movie, right? Something epic, scary and visceral. Alien: Covenant is none of those things. It’s just there. You almost wish it was terrible because then at least it would have taken some risks. Instead, you’re left with an instantly forgettable piece of entertainment with boring characters, obvious mysteries, and none of the horror that made the Alien franchise so great. Alien: Covenant opens May 19.